As 2007 draws to a close, I wish you all a Happy New Year and may 2008 be even better than 2007. Except for the loss of Tova a couple short days ago, this was not a bad year for the family, but the exception certainly overshadowed much of the good that was to be had this year. Enjoy the last few short hours of 2007 and good luck to you in 2008. Mike Cox, the excellent Attorney General for Michigan, has just issued an Opinion that would seem blatantly obvious and amazing that it wasn't the law before: -- Opinion #7210 Illegal Aliens cannot get Driver's Licenses in Michigan. Prior to this ruling, Michigan was one of eight states that let illegals get licenses. Given the Motor Voter Act, and how the license is the gateway identification card for just bout everything a driver's license is a short step to let an illegal vote, get on a plane, get inside a federal building, and various other security holes. About time someone concluded the obvious. Its amazing it took this opinion to stop Michigan from doing what it never should have done in the first place. Yesterday night, Friday, December 28, our dog Tova suddenly became sick, and we rushed her to the vet clinic. After a variety of tests, it was found that she had cancer and that it had spread all along her right side. There had been no previous symptoms and this was a complete shock to us. We decided, in one of the hardest decisions we've yet had to make, that she would be put to sleep as no treatment could cure what she had. I held her while it happened, as the vet gently gave her the shots to put her to sleep, and she calmly went to rest. So ended 9 wonderful years of companionship with a very good dog. We were lucky to have Tova. A friend of ours found her abandoned at a highway rest stop, at about 12 weeks old. She immediately bonded with us from the moment he brought her to us, knowing that we wanted a dog. Once we saw her, of course we couldn't turn her away. We named her Tova, the Hebrew word for good, and she lived up to her name. We think she was an Alaskan Sled Dog, a mixture of Husky, Lab, Shepherd and Malamute. She certainly had a Labs' sweet disposition, with a Husky's pulling drive, and many ingrained snow dog habits -- she loved to lay out in the snow in the winter, only coming in for a treat and then demanding to be let outside again. Of course, she wasn't against being spoiled, and as soon as she grew and decided she didn't want to be spending the night in her crate, she claimed the couch as her own, when she wasn't on the bed. A kinder, sweeter, better-dispositioned dog is impossible to imagine. Always patient with children, Tova would let them pull on her ears, tail, nose and even stick their hands in her mouth without the slightest growl and she never, ever, bit anyone. She also had a real smile that she would display when she was happy. Did I mention she was also very smart? Tova was also great with our kids, and did not have any issues with the new additions to the family. She was very friendly with them and acted in a very protective manner - sleeping under their crib or outside their door at night. The kids enjoyed being with her, feeding her, brushing her and walking her. Leah's first word after Mama and Dada was Dog. Farewell, good, true and faithful companion, thank you for the time we had with you and how you lived up to your name every day. Goodbye Tova. 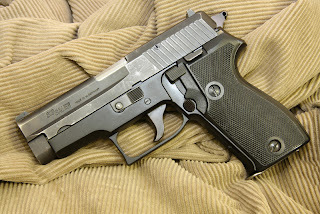 The Sig Sauer P225 was designated by the West German Police as the P6 in the 1970s, when it, along with the HK P7 and Walther P5 were the approved pistols for purchase by the various West German police agencies. The pistols are now being replaced and are sold as surplus to shooters at excellent prices. This is a 9mm, 8 round, 26.1 ounce, semi-automatic pistol with a decocker, so the pistol can be carried with the hammer down and the first shot is double action and all subsequent shots are the Sig-smooth single action. As I noted in the previous post, I took it out shooting for the first time Sunday, and it was perfect right out of the box. No feed issues and yes I could make 100 yard hits with ease. Never having had a Sig-Sauer pistol before I now know what the fuss is all about. Simply an ergonomically excellent, solid pistol, and for a 1980 dated gun its in very nice condition but with noticeable finish wear. It seems this one was carried far more than it was shot as it is mechanically excellent and a nice tight firearm with excellent accuracy and the forgivable holster wear gives it character. I'd certainly recommend this as an excellent choice for a defensive pistol for carry or for home defense. While it is larger than many of the typical 8 shot 9mm pistols available these days, the compact but not tiny size makes it very easy to shoot and the price for these fine surplus firearms, around $300 or so, is simply fantastic. You can read his good summary of events at his blog post Shooting. As he said, we traveled to the Lapeer Pit and did some shooting. Many a junked gas can, coffee cans, a 5 gallon bucket and one hard drive gave their lives valiantly as targets. Before we went, we did a little work on my Glock 23 and Glock 19. After reading Lagniappe's rave review of the Lone Wolf Distributors 3.5 lb trigger connector, I decided to buy them for my Glocks. With his help, disassembly, cleaning, installation and reassembly of both Glocks took 22 minutes. Very simple yet elegant design, the Glock. The connectors really cleaned up the trigger pulls making them much smoother, with the result that I was able to hit, repeatedly, the 5 gallon gas cans that were at 100 yards with my Glock 19. This led to quite a bit of comment from some of the other shooters that were present, especially the fellow with the scoped shotgun that couldn't hit any of the gas cans at 100 yards who could not believe it could be done with a handgun. The Uzi functioned perfectly, and Lagniappe's 1919 was as always a great item to shoot and makes me quietly envious of his belt-fed goodness. Similarly, his AR15 was a joy as ever to shoot - aim and hit,any target at any range, that simple. I really need to get my own AR15 out more. A most excellent time with a good friend at the range, what could be better? Well not falling on the ice while holding a box of 1919a4 links would have been a bit more of a graceful end to the shooting session, but someone had to provide the comic relief (in addition to the fellows out bump firing their AKs and SKSs and missing everyhting but the berm.....) and it might as well have been me. After the largest tax increase in Michigan's history she promises not to do it again. Not because she wouldn't want to mind you, but because it would be too hard. Gov. Jennifer Granholm, stung by outrage from the business community over a now-repealed tax on services and some discontent with a state income tax increase, says she won't resort to tax increases to cover any future shortfalls. "The most important thing I learned (this year) is I'm not ever going to raise taxes again. It's too hard. It's too impossible," Granholm told The Associated Press.Especially in light of our economy and what we've been through, I just don't think that there's anybody who's interested in proceeding down that path again. And I'm first at the head of that line," she added. The Granholm administration still is asking for fee increases to help fund the state departments of Natural Resources and Environmental Quality. Lawmakers have agreed to take up the proposed raises in hunting and fishing license fees and DEQ permitting fees next month. Government revenue grabs never stop -- now let's balance the budget on the backs of outdoorspeople and people needing government permits. But the Democratic governor made it clear she'll be looking at other ways to deal with the budget during her remaining three years in office. "It has to be cuts and reforms. And there's got to be some creative partnering with the private sector on some stuff, too," she said in the interview Tuesday. "You'll hear more about that later." Well it took her long enough to come around to the reality of the situation, that in a one-state recession raising taxes is just not a cure-all and is contraindicated. Girl, 7, shot 6 times saving mom: Calvin Tillie, 29, a four-time convicted felon and ex-boyfriend of the mother in this situation, after forcing his ex-girlfriend and 7 year old daughter, and a family friend, into a car at gunpoint, then after the mother drives them to a gas station and the family friend tries to call police, the scumbag then shoots the mother. The 7 year old heroically covers her mother with her own body and the scumbag shoots a 7-year old kid six times. There are no places hot enough in hell for this scumbag, and this is certainly one of the few people that creates regret that Michigan has abolished the death penalty. Similarly, words fail to express the great heroism of Alexis Goggins, the heroic first grader. thankfully both mother and daughter have so far survived and Alexis is in stable condition. May God grant her and her mother a complete and full recovery. Ford [a 15 year old who was also kidnapped by the felon] said she dialed 911 on her cell phone as she walked into the station. "The first operator clicked off and I dialed again and told that operator a guy with a gun was holding me hostage with a mother and baby and threatening to kill us. I told her the name of the gas station and then she said they didn't have a unit to send. Relying on police, and given the failure of the first 911 operator to even deal with the call and the second noting there were no police available to be sent, led to tragedy in this case. It may very well have been that there were no police available, as the police obviously cannot be everywhere and can almost never respond in time to save one from a violent felony that is occurring. While it seems the police arrived apparently in time to finally end the attack, it was not before a lot of damage was done -- these people were on their own and had to rely on a heroic 7 year old to save their lives. Update: There is now a fund where you can make donations to help the family: Alexis Goggins Hero Fund, c/o Comerica Bank, Campbell Elementary School, 2301 E. Alexandrine, Detroit 48207. Dive number 67 took place tonight in Union Lake. About 30 minutes at a max depth of 28 feet. Water temperature was 39 degrees, which was quite brisk even in a dry suit. Adding to the thrill was the pitch darkness and the remains of snow on the ground from Saturday's snow storm. Visibility was not very good tonight with only a few fish and crayfish visible. Not a bad dive, and it was a great reminder that I need to keep working on my trim and kick techniques. The Free Press, given that it seems there's never a way to increase taxes that it can't get behind, is pushing for the expansion of Cobo Hall, to be paid of course with the taxes of at least the tri-county (Detroit and the 3 main counties) area. The ostensible reason is that the Detroit Auto Show exhibitors want a larger exhibit hall, and for some reason the taxpayers should shoulder the burden for this yearly event. In Grow Cobo now!, the Freep editortial calls for an extension of the already existing special liquor and hotel tax that is already being used to finance the previous Cobo Hall renovation. Unfortunately, that must happen in Lansing, where nothing comes easily these days. Special taxes on Detroit-area hotel rooms and by-the-drink liquor, scheduled to expire in 2015, must be extended as a key component of funding the Cobo project. Read that again, the tax on the original expansion in 1985 still hasn't fully paid off the prior expansion and will not do so until 2015 and they're talking about extending it for even more future renovations. The hotel-liquor taxes were enacted for Wayne, Oakland and Macomb Counties in 1985 to pay off bonds that financed the initial expansion of Cobo, which opened in 1960. The room tax ranges from 1.5%-6% depending on the size and location of the hotel or motel. The drink tax, which most people don't even know they pay at bars and restaurants, is 4%. Any balance from the taxes after the debt service is paid is distributed on a per-capita basis to all Michigan counties, or at least it was until this year, when the Legislature raided the fund for $37 million to help balance the state budget. Why wasn't the money every year paid out to more than just service the debt but to retire it -- or at least to bank it away for this latest expansion. Simply wasteful spending of tax dollars as usual. Travelers also would pay a part of the drink tax, and local drinkers cross county lines so regularly that the tax cannot be seen as an unfair burden on Wayne, Oakland or Macomb residents. Saty that again? How many residents of these counties leave them to go to a bar, what proportion of regular bar patrons come from outside these counties? Not too darn many in either case. For the sin of having an early primary. Interestingly enough such a removal, and the failure of 4 of the candidates, Barack Obama, John Edwards, Joe Biden and Bill Richardson, to participate in the Michigan primary process makes the democratic primary in Michigan relatively meaningless as the result will not be used to select the Democrats' presidential candidate. On the other hand such an exclusion turns it into an exercise in the anointment of Hillary Clinton as the candidate, which may have been the DNC's goal in the first place (while Dems may be going nuts in a leftward direction fast, most Michigan Dems are not far gone enough to seriously and soberly vote for Kucinich - one hopes). Unfortunately this gives Democrats in Michigan the opportunity to cross over and meddle in the Republican primary - expect to see a sudden surge of support for Ron Paul when the primary takes place. For all that, The best line of the whole article goes to quote by Debbie Levin, a Michigan member of the DNC and part of the politically powerful Democrat Levin family . "Democrats are the party of the people, not the party of privilege," Dingell said after the ruling. "The other party is the party of privilege, and yet they have treated all the states equally." It is unreported but it is likely that she was able to keep a straight face while saying it, and while admiring Edwards' unprivileged $400 haircut and Al Gore's unprivileged unpretentious, "energy-saving" house (it only consumes 20 times the amount of energy an average family uses). It's also unreported as to whether the Detroit News reporter Gordon Trowbridge could keep a straight face while taking that line down. As mentioned below, we had planned to go to a well recommended Polish restaurant yesterday, but on arrival to it, we found it is closed on Saturday nights. We could insert some Polish jokes here about the business sense of being closed on a major night for people to go to eat but we'll let it go. Happily, nearly across the street was a Polish market. I always enjoy shopping at an ethnic market- you never quite know what you'll find and often you'll come across some very tasty products. Give that Natasha is a Russian ex-pat she had a great deal of experience with Polish products from soviet days and had a blast going through and buying all sorts of tasty treats. The selection was impressive - a great deli, wonderful prepared foods and more. We each bought a complete ready to eat dinner there for about $5 each, as well as some very nice deli meats and dairy products. A wonderful thing about this global world we live in is how products can move around and we can be exposed to new and interesting things. Coffee, being a daily essential here in the house, is always of interest. The market had a full aisle from floor to ceiling, full of different European coffees. This was good. Of course, most labels were in Polish or German so this would take some doing. After careful guesswork, I settled on a label reading "Tchibo Family Intense Coffee" - The name itself sold me. So this morning we opened the coffee and made a pot, and poured a cup for each of us. Poland does not have a worldwide reputation for great coffee so we each took our first sips hoping for the best. Intense is certainly a word for this coffee - very dark, bitter and robust, a real eye-opener, not for the faint of heart or those who like their coffee weak. This was a definite eye-opener, not a sipping coffee. Good stuff for a morning wake-up. And it all grinds to a halt. On our night out, we went across town to a restaurant (more on that later), which didn't quite work out as planned, and instead ended up at a market with a nice meal to take home. However, once we were done, we looked outside and the car and everything else was covered in snow. Yes, the first snow of the season and no one remembered how to drive in it. Multiple accidents were seen, roads were actually closed by police when people couldn't get up hills, and on one lane, relatively clear, roads, we were stuck behind a guy in a car that didn't seem able to go faster than 15 on a straightaway, and he added to the fun by occasionally braking and coming practically to a halt for absolutely no reason as he was on a straight road with absolutely no traffic in front of him for at least a mile, as they had all gone about 35 on the same road that is typically 45. - no don't speed but at least drive at a speed appropriate to the conditions. But alas, it takes time for the lessons to be relearned. A threat to the planet, eh? The problem is that the beer fridges are mostly decades-old machines that began their second careers as beverage dispensers when Canadians upgraded to more energy-efficient models to store whatever Canadians eat besides doughnuts and poutine. Actually instead of buy-backs the Canadian model would be to register and then confiscate the fridges. Then after an increased tax provide, the Canadian government would establish universal fridgecare, with a waiting list for a new and efficient and environmentally conscious beer fridge. Somebody please tell me this is a parody. I can only see Canadians giving up their beer fridges when they're pried from their cold, drunken fingers.